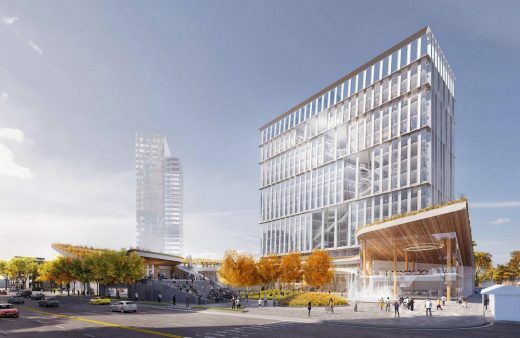 Diamond Schmitt Architects is among a shortlist of firms selected to design a new civic centre for the Toronto suburb of Etobicoke. The scheme was recently presented at a public event. 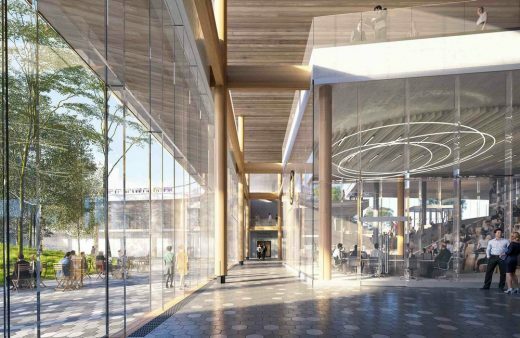 Central to the inspiration for Etobicoke Commons is to create identity and a civic heart, a destination for the public to engage in any number of activities, from recreation and learning, to attending to business at municipal offices. The scheme includes community amenities of health services, public meeting spaces, a fitness centre and pool, a library and retail. A low-rise, tiered podium of folding, grass-lined surfaces houses all the major public spaces and surrounds The Green, a landscaped and inviting urban oasis at its centre. 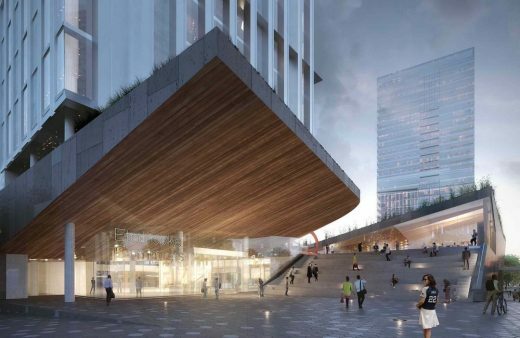 The design supports two amphitheatres, an elevated Sculpture Walk, inclines for summer lounging and winter tobogganing, as well as terraces for small gatherings, a daycare play area and space for outdoor markets. “Many civic squares have large expanses of one-dimensional and spatially barren surfaces; in contrast, on offer at Etobicoke Commons is a multitude of dynamic public spaces that support different uses, are of varying sizes, and are adaptable to changing seasons for the public to really use,” said David Dow, Principal, Diamond Schmitt Architects. A generous glass façade extends the public realm into and throughout the building. 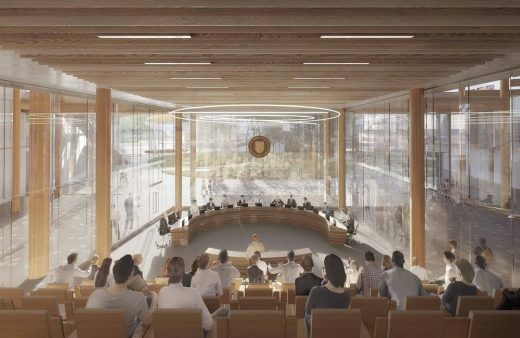 This transparency embodies the values of civic administration and is reinforced by a glass-lined council chamber that is adaptable for other community uses. The Great Hall is a multi-purpose space that orients and provides access to all activities and services within. 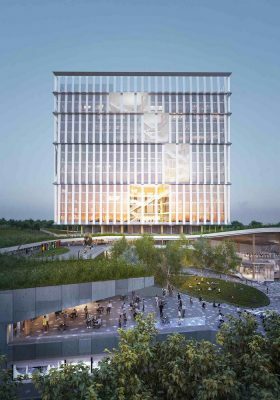 The office tower above has a sequence of stacked atria that enable interaction among staff in both formal and informal settings. 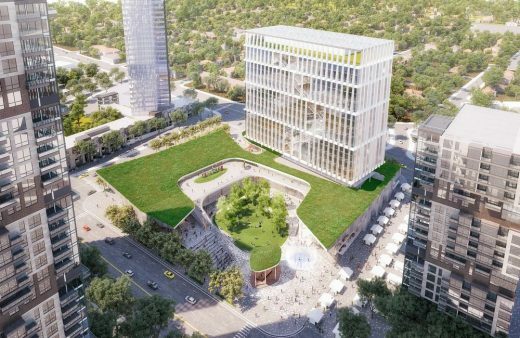 The scheme is designed to achieve Net-Zero through a combination of robust strategies to reduce energy-use intensity and generate on-site energy. A carefully calibrated window-to-wall ratio is supported by photovoltaics in roof and skin, triple-glazing and view dynamic solar control glass. 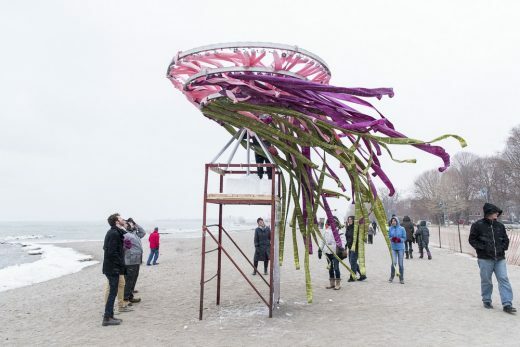 “Etobicoke Commons is meant as a meeting point and catalyst for increased interaction by the community in a setting people can enjoy and that has enough variety and flexibility to make it their own,” added Dow. Diamond Schmitt Architects (www.dsai.ca) is based in Toronto. 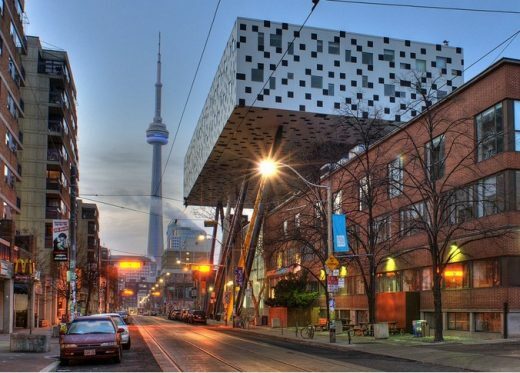 Informed by urbanism, driven by design, the firm’s extensive portfolio includes performing arts centres, residential and commercial buildings, research and academic facilities. 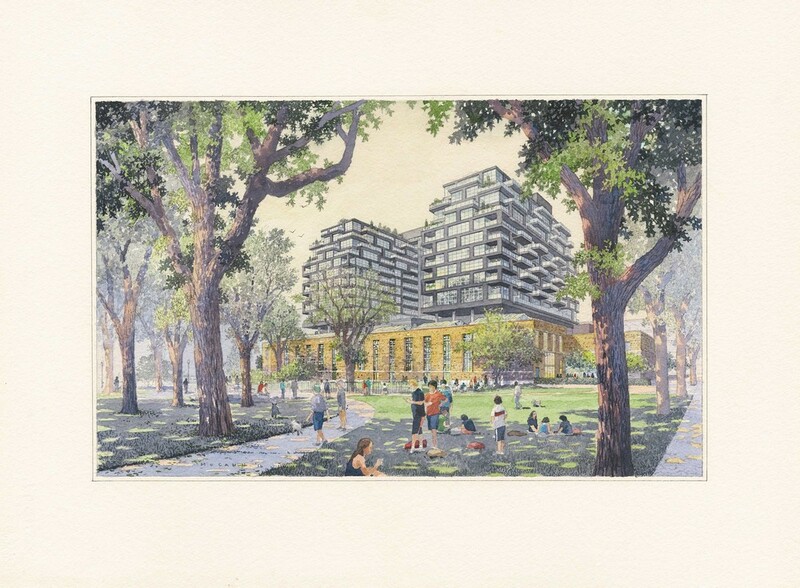 Current projects include the design for David Geffen Hall at Lincoln Center in New York City; the transformation of the National Arts Centre in Ottawa; multiple projects for Canada’s largest urban development, Vaughan Metropolitan Centre; and the new campus for Emily Carr University of Art + Design in Vancouver.